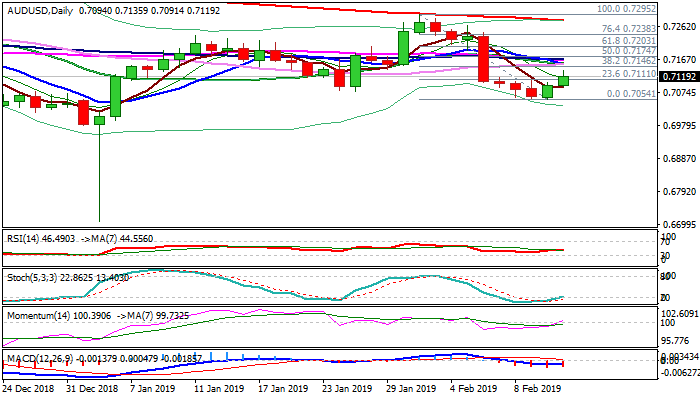 The Aussie dollar extends recovery from 0.7054 lows, underpinned by surge of kiwi dollar on less dovish RBNZ earlier today and fresh risk appetite on renewed optimism over US/China trade talks. Double rejection at 0.7054 signals basing, with Tuesday’s bullish outside day adding to bullish signals. Technical studies support recovery action as momentum is entering positive territory and stochastic emerges from oversold zone. Bulls face strong barriers at 0.7146 (Fibo 38.2% of 0.7295/0.7054) and a cluster of converged daily MA’s (10; 20; 30; 55SMA’s) at 0.7156/66 zone. Firm break here is needed to confirm reversal and open way for further retracement of 0.7295/0.7054 bear-leg. The downside is expected to remain vulnerable if recovery fails to clear these barriers.